WB and EB at the same gantry just west of I-81, courtesy Doug Kerr. Signs have since been replaced, sadly. Just north of there, this arch sits lonely in a field, crossed by no road or path. I can't tell what was ever here, but it seems from historical photos that this is not one of those modern "fake stone" bridges. 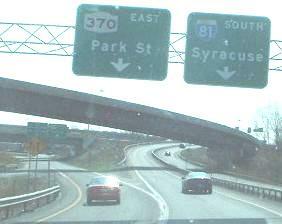 Click to drive northwest on the NY 370 Onondaga Lake Parkway. You'll get to see a cool rail trestle that I haven't photographed (because I was taking video still).